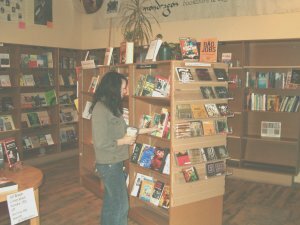 In 2005, a popular restaurant in the Exchange District, Mondragon Bookstore & Coffeehouse was purchased by its employees to become Mondragon Worker Cooperative. The Jubilee Fund was able to assist the employees to purchase the restaurant from the previous owner. The members expanded their menu and added a number of new books to their library. In 2009, they launched an Organic Grocery Store and Delicatessen to increase sales and provide organic produce for residence of the Exchange District. The Jubilee fund assisted the Co-op with a loan guarantee to purchase stock and fixtures to establish the Organic Grocery Store. The Bookstore Coffee House was for many years, one of the only locations in the area that offered a cozy coffee shop environment and a place for residents to socialize.